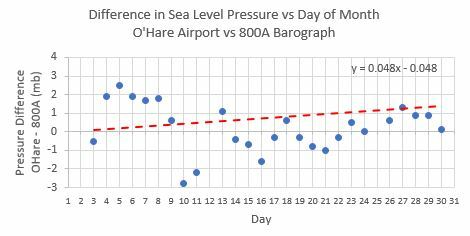 For the month of January 2017 I analyzed the accuracy of my Belfort 800A microbarograph by comparing its recorded sea level values with values from the US National Weather Service (NWS) at O'Hare Airport near Chicago, Illinois. O'Hare is 22.7 km WNW of my location. Values were determined once-per-day near midday. The average error was calculated. It is the average difference calculated as the O'Hare barometric pressure minus the pressure read from the barograph. The standard deviation of the individual error values was calculated. By definition, 68% of the error values fall within +/- one standard deviation of the O'Hare barometric value. The average error can be reduced by recalibration of the barograph, while the standard deviation generally cannot, it is more inherent in the performance of the barograph. The average drift was calculated. This is simply the slope of a straight line fitted to the the scatter of error data points plotted against day of the month. It is an indicator of how the error changes with time. Finally, the average non-linearity was calculated. This is the slope of a straight line fitted to the scatter of error data points plotted against the O'Hare barometric pressure, in mb per mb of barometric pressure. It is an indicator of how much the error changes on average with the local pressure. For the 800A, the calculated average error for January 2017 was 0.75 mb, while the standard deviation of the error values was 3.08 mb. There was a noticeable drift in the error values, amounting to 1.49 mb/month. The calculated nonlinearity was 0.033 mb per mb of barometric pressure. Plots of the error values showing the scatter, drift, and nonlinearity are presented below. My conclusion is that my 800A microbarograph needs recalibration. I will recalibrate it to match my mercury barometer sea level value before the beginning of March 2017. I will repeat this evaluation in April using the March data. Go to Belfort 800A microbarograph page.